The American Presidents Series is no-doubt familiar to any reader taking on the task of reading a biography of every U.S. President. They’re known for their brevity and for their straightforward, no-nonsense approach to their subjects. I’ve found them to be generally well-written, but one typically doesn’t come away with a deep understanding of the men profiled. In many cases, I’ve learned more about these particular Presidents via my other readings than I have in these books dedicated to their life stories. All that being said, I’m currently engaged in a fairly mundane Presidential era, that being the years between the presidencies of Andrew Jackson and Abraham Lincoln. Some of these Presidents, to my surprise, have been much more consequential than I was led to believe by their relative obscurity (Polk, Van Buren), but others such as John Tyler, William Henry Harrison or Zachary Taylor have proven to be as lackluster as their reputations have suggested. Why do I keep coming back to the series then? Well, there just are not that many books written about some of these dudes. So, rather than tackle a, say 500-page bio written in 1950s about a President that served for a mere month (Harrison), I’ve instead at times opted for the shorter route. I’ve got 180 books to read in this project, sometimes you opt for the efficient if unexciting shortcut rather than the more arduous scenic route simply to make up time. Anyway, this latest effort in the series is my fourth, and in some ways was my least favorite of the bunch. I enjoyed Ted Widmer’s book on Martin Van Buren and equally enjoyed Gail Collins’ effort on behalf of William Henry Harrison. But I found Eisenhower’s contribution, like Gary May’s John Tyler, to be pretty forgettable. Eisenhower was, it should be said, a sensible choice to write this volume. The son of Dwight D. Eisenhower, his book on the military history of the war with Mexico, So Far From God, is still considered the definitive account of the conflict for most readers. I opted for Amy Greenberg’s political history, A Wicked War instead though, and I’m glad I did. Eisenhower is just not a very engaging writer, at least not here. And his sections of the book detailing Taylor’s military campaigns (the bulk of his life) I found to be confusing, abstract, and a bit tedious. Descriptions of these battles in Greenberg’s book as well as Hampton Sides’ Blood and Thunder and even Borneman’s Polk were far more engaging and less concerned with the minutiae of which specific regiment or brigade lined up behind which particular gully or redoubt. But Eisenhower is a military man, and that is clearly his area of chief interest. I simply found the accounts hard to follow without corresponding maps and tactical diagrams. 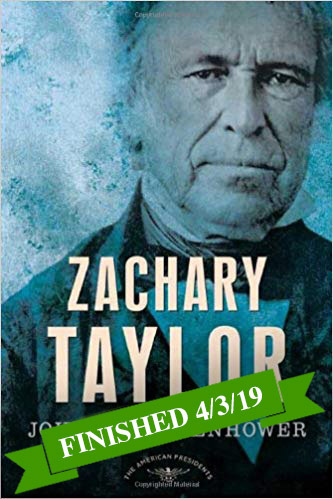 As for Taylor, he’s admittedly a difficult man to write about with much depth as all of his papers and correspondence were burned (unknowingly it seems) by the Confederate Army during the Civil War. So we get multiple instances in the book where Eisenhower is left to write things like, and I’m paraphrasing here, “Taylor continued in this post, uneventfully it seems, for the next 5 years…” There just isn’t much of a record. Taylor appears to have been an effective, if not particularly brilliant general, who was deeply admired by his men. His down-to-earth demeanor and his lack of pretense engendered love and loyalty from his troops, though the hero status that he emerged from the war with and that catapulted him to the White House seemed vastly overblown. As President, he was a reluctant Whig (he was never particularly political by nature) who didn’t reside in office long enough to make much of a mark. His administration’s chief accomplishment seems to have been the passage of the Clayton–Bulwer Treaty that resolved growing tensions between the U.S. and Britain over a potential Nicaraguan canal connecting the Atlantic and Pacific. Not exactly the stuff of enduring works of narrative history. Taylor died not long into his first term of some kind of intestinal condition that was inflicting nearly everyone in his orbit after he ate copious amounts of raw fruit and milk one day. Afterward, there were rumors that he was actually poisoned by pro-slavery Southerners but this was never proven and seems apocryphal at best.